In late July I went to the Ottawa Linux Symposium. I've always wanted to go to a Linux Conference, and for once there was one within driving distance. [Yes, oddly I now live closer to the capital of Canada than the capital of the US. If this were Civ3 I'd worry about Ithaca flipping sides! Thankfully New York City is nearby pushing out a lot of culture. They have a wonder, the Statue of Liberty! (wait... that allows a change of government in one turn.. uh oh)]. In any case, my friend John and I decided to go together. He met me here and we headed up I-81. We had Susie the guinea pig in tow, as I was unable to find anyone to watch her. Apparently it is perfectly legal to take a pet guinea pig to and from Canada, although getting any of her favorite foods along (carrots, lettuce) is of a more questionable legality. After clearing customs and a seemingly bored border agent who asked some confusing questions, we were there! Though it was dark by this point so you really couldn't see much. It was exactly 0x100 miles (256 if you have 10 fingers) which seemed appropriate somehow. The fact that the mile markers were really kilometer markers kept confusing me. We found Les Suites surprisingly easily, and checked into room 1212. Fancy place, we had a whole suite including a washer/dryer and full kitchen. Unfortunately our ethernet port didn't work and there was no wireless the first night. Thanks goes out to the people with the "nocabal" access point which enabled us to have internet access most of the rest of our stay. One thing about the hotel... it has the most inefficient elevators known to man, even worse than the ones in Rhodes Hall at Cornell. There were some odd shows on TV late at night, including Rocket Robin Hood. I tried some traditional Canadian dishes. Well, not really. I did have some poutine though. The conference was great. Four days of talks and there was at least one interesting talk for almost every time slot. I won't go into the details of the talks here, check out the OLS page and you can read the proceedings. The big news was the "development will happen in 2.6 rather than 2.7" Linux kernel announcement, and also all of the cool X stuff Keith Packard, Jim Gettys, et al are doing. AMD was doing lots of interesting stuff. They sponsored a talk on the first night. I didn't win any of the raffle prizes (nor had to answer the "test of skill" question in order to receive the prize due to odd anti-gambling laws). We had a bizarre speaker who seemed to miss the point and whose readings quickly got tedious. Alan Cox teased about sitting at our table, but instead sat with his wife Telsa and the linuxchix. Speaking of Alan Cox, walking around between talks was like being in a living linux-kernel mailing list. Just about every big name was there. Including Linus. I walked around scanning nametags, but didn't really talk to anyone. I am out of touch with kernel development these days and really wouldn't have anything to say besides "hey, you're famous" which really didn't seem necessary. I didn't go around taking pictures of them either, that seems to me to be weird paparazi-stalker-esque. I did my standard buy-lots-of-postcards activity. So I got to search out a local Post Office to buy stamps. (It cost $.80 to buy special "to the US" stamps which according to the clerk were good for both postcards and letters). I overshot the post office at first and got a nice walking tour of Ottawa before I backtracked and found it. Beautiful weather. The conference center is downtown on the canal, built into a mall. Our hotel was only a block away. 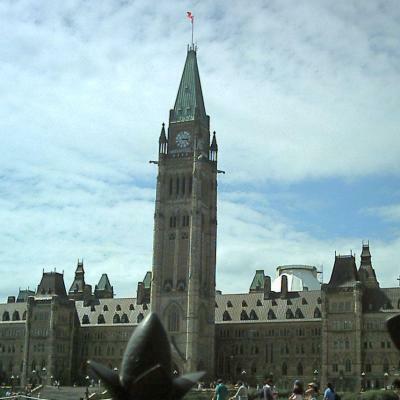 Here's the Canadian Parliament building. All the major government buildings were in a row, along the Ottawa River. 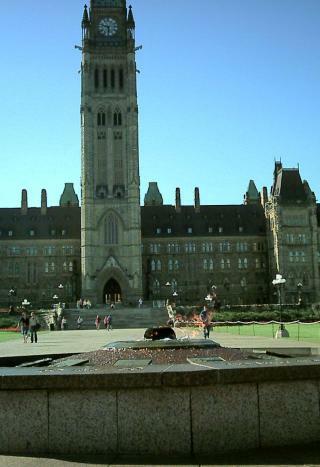 In front of Parliament and reeking of natural gas is an Eternal Flame apparently signifying Canada's unity. 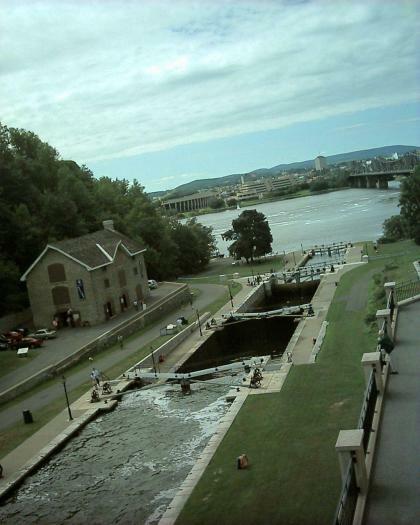 Here's a picture of locks on the canal. The canal was built in reaction to the War of 1812. The Canadians were afraid the Americans would do something stupid again, and might blockade the St. Lawrence River. So they built a canal from Lake Ontario to the Ottawa River so traffic could bypass the American border. The locks are still in use. John and I spent a fascinating hour watching what appeared to be college students on summer jobs raising four boats up the canal by hand-cranking the locks open and shut in series. Fascinating if you are an engineer. I then walked by the US Embassy, which I had heard was an ugly monstrosity and that's not far from the truth. There was a lot of cool varied architecture in the city. 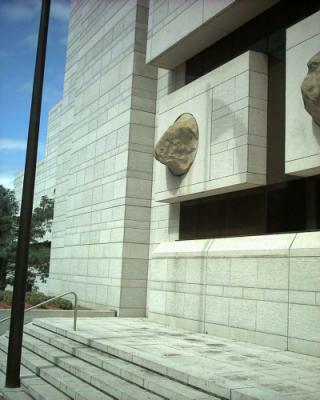 Including some odd things, such as this government building that literally had rocks jutting out of it. The keynote address by Andrew Morton was the very last event. I'm sure to be in a lot of pictures, as the people in the row behind us set up an inflatable penguin; everyone at the conference had to take a picture of it, with me in the foreground. I still am seeing spots from all the flashes. I can also still hear the comments after another blast of light seared itself onto my retina "Oh, I don't think my flash works from this distance but I thought I'd leave it on anyway." Thanks. After 5 days in Ottawa it was time to head home. My car was in the hotel's parking garage in the narrowest possible spot. I originally had to take the guinea pig out through the trunk as I couldn't open the doors wide enough for her cage! I took a picture of this spot but sadly it didn't turn out. Luckily getting out of the spot was much easier than getting into it was. The drive home went fine. It's very flat and farm intensive until you get close to the St. Lawrence. A surprising amount of traffic, although next to no SUV's when compared to driving on a US interstate. US Customs was backed up a bit but didn't take that long once you made it to the front. The 1000 Islands looked neat, at least what we could see of it. And soon enough I was back home in Ithaca. 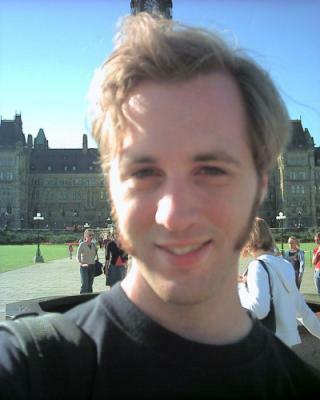 Here's a picture of me in front of the Parliament Building. Back to my pictures page.